The great thing about Jos, and it was well spotted by Ed Smith as the start of the summer, was that he arrived back in the UK on the crest of a wave based on the Indian Premier League. Everyone quite rightly said IPL and Test cricket are very different and asked will he be able to cut it in Test match cricket? The one thing that applies to all cricket is confidence and if you come back from overseas playing in one the world's premier competitions full of confidence, it can spill over. He started the summer well against Pakistan, his first innings against India was tricky but he has confidence at the moment and the more you play well at this level, the more you know you can do it. If you've got a question mark against yourself, which is what Buttler had from his previous Test matches, there is doubt in your mind and you have to work mighty hard to overcome that. There is maturity, a greater appreciation of what he needs to do at this level and he has been clever from the start of the series. When the ball has been swinging he has been doing things other England batsmen were not - in terms of getting himself out of the crease and out of danger. He backed his ability, used his confidence and he will now know after this summer that he fully deserves a place in Test match cricket. For every player, whether you get that early in your career or whether it takes you a few years like it has with Jos, it is vital because you need to know that you belong at the highest level and once you know that you can play with a relatively naturally and prosper. He has been England's batsman of the series. Jos has played in a couple of different positions in the middle order, he has had situations where he has had to decide how to play as the remaining strong batsman with the tail and he has done that beautifully. He enjoys what he is doing out there, there is a steel and determination and of course the great thing is there is a lot of talent there too. England batted well this morning, Buttler was outstanding and Broad almost unusually dug in. I predicted on air he would actually play a few more shots than he did. Watch all the action from day two of the fifth and final Test between England and India at The Oval. Broad played the right way and India gave both batsmen too much scope. There were too many spaces and gaps rather than bowling properly at a tailender as you would a top-order batsman, they allowed them a little bit of freedom. That allowed England to settle and we have seen it countless times over the years, as soon as you get a partnership developing like that down the order it seems to change the psychology. Virat Kohli needs to re-think how he does that if he gets in a similar situation in the future against another team. It has been a crucial passage of the day because I thought at the start of day that England would struggle to make 250 and when they get way past 330 it makes a huge difference. India seem to have come up against the worst of the conditions again as it got more and more overcast as the day went on. For quite some time in so many of these innings, the ball has done lots both in the air and off the pitch and that is a combination of the balls, the atmospherics and the grass on the pitch. I have a lot of sympathy for anyone trying to bat under these conditions, the Indian batsmen did their best, Cheteshwar Pujara was trying to be watchful, KL Rahul tried to be a bit more positively and Kohli was Kohli. For Hanuma Vihari playing in his first Test match to come up against cloudy conditions, the lights on, and Anderson and Broad in the midst of seriously good bowling spells - that is one of the toughest debuts you will make. The battle between Anderson and Kohli throughout the series has been fascinating, invigorating and everything you could have wanted. 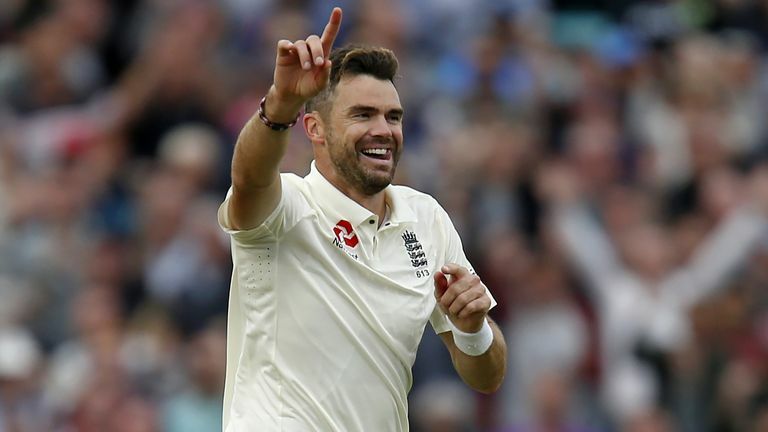 Anderson has bowled consistently well, Kohli has runs - all that talk about his failure four years ago is long since dead and buried - and Kohli has used up a bit of luck at times right from the first Test match. Virat has earned his runs and Anderson has deserved more in terms of that particular contest - the score is a little uneven and it could have been a little bit different but it has been a great contest. Watch day two of the fifth Test between England and India from 10am, Sunday on Sky Sports Cricket.